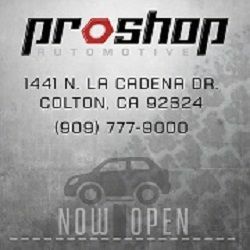 Proshop Automotive - Proshop Automotive - An ASE Certified Shop providing quality auto repair services to all the vehicle owners in colton, ca and surrounding cities. Schedule an Appointment today! ASE Certified Auto Repair Shop - Proshop Automotive conveniently located in Colton, CA. Here at Proshop Automotive, Auto Experts can help as your one stop Auto Service station, providing quality and customer service and also follow a strict code of ethics so customers will know up front what to expect when they require auto repair services from us.